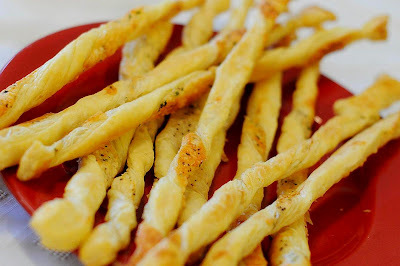 Cheese straws look and sound sooo yummy! I have to comment on the cupcakes you made for Lily. I saw them on Auburn's blog. They looked so good my mouth started watering (no joke). I've been wanting to make cheese straws. Your's look awesome. Don't you just love Ina (I know you do, that's a rhetorical question!) Those cheese straws look like something I would build a meal around just to justify having them for dinner. I LOVE your new header!!! Love the new header Kristi! Are those Eiffel Towers I see in the font...so cleaver of you to sneak them in like that! And I still prefer Lion House banana bread too, but didn't want to say anything because Ina's come in a close second.